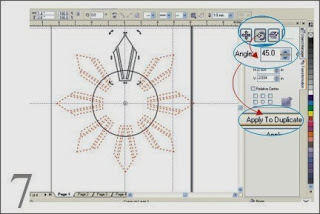 It is easy to create simple shapes in CorelDraw because of its built-in tools for creating circles, ellipses, squares, rectangles and polygons. 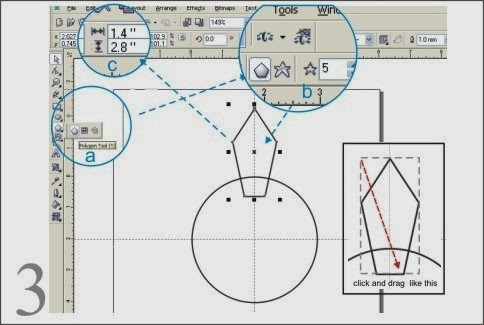 These simple shapes can be use for creating complex shapes. 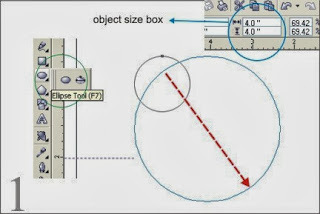 This tutorial will show you how to: (1) create perfect circle; (2) use polygon tool; (3) trim objects; (4) rotate objects; and (5) weld several shapes into one. 1. Click the Ellipse tool, drag it diagonally while holding down the CTRL key to draw a perfect circle. 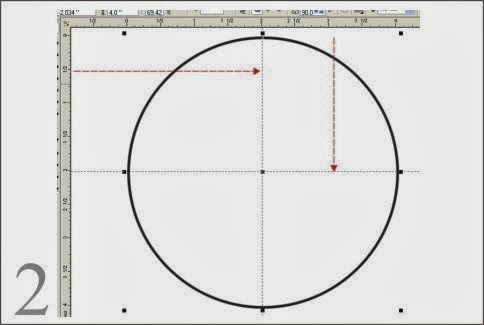 In this tutorial we will use a circle with 4 inches diameter. 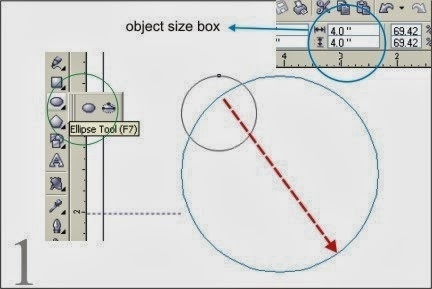 You can specify the diameter on the property bar’s object size box. 2. Using the pick tool, click on the circle for you to determine its center. Now, set the guidelines to the center of the object by simply click-and-drag down from the ruler at the top to create a horizontal guideline and click-and-drag from the ruler at the left to create a vertical guideline. 3. Click on polygon tool (a), set 5 sides (b), drag and position it above the circle and specify its size (c). 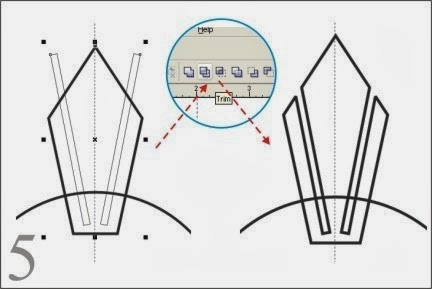 The position should look like the image below. 4. 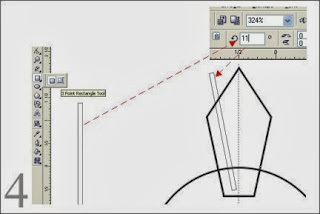 Click on the rectangle tool, drag downward to created a vertical rectangle (0.1 in x 2.6 in). Rotate it (about 11 degrees). . Btw, you’re not required to work on exact measurements, I have just specify them to serve as a guide or for us to come up with a uniform result. 5. Press ctrl+D to duplicate. Select the two rectangles, press “T” (to align top), press CTRL + G to group the object and position it like to the center (vertically) of the polygon. Now we’re ready to trim the polygon. 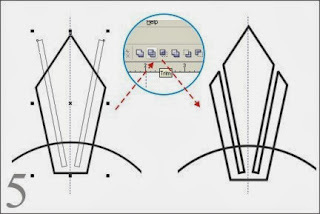 To trim, (a) select the source object, (b) hold down Shift and click the target object (the polygon) and (c) go to Arrange > Shaping > Trim or simply click on trim icon on the property bar. 6. Double click on the polygon to get the rotation arrows. 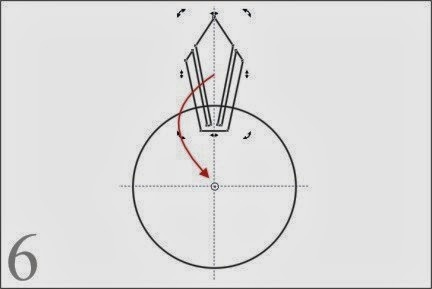 Move the center of revolution to the center of the circle. The center of revolution is a small circle with a dot in it. It will originally show up in the center of the polygon. You can click-and-drag it into place. 7. With the object polygon still selected, choose ARRANGE > TRANSFORMATIONS > ROTATE. A dialog box will appear. On the angle box type 45 (360 degrees – that is 1 revolution. 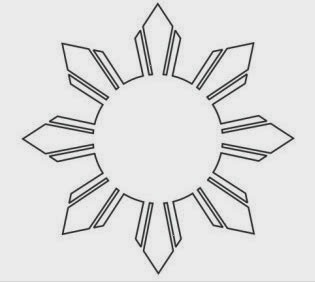 We need 8 rays, let’s divide 360 over 8 and the result will be 45). 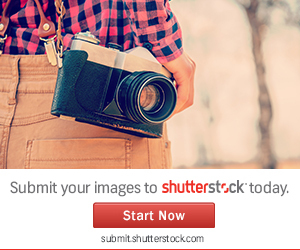 Then click APPLY TO DUPLICATE seven times. 8. Click-and-drag a marquee around all of the shapes to select all of the objects. 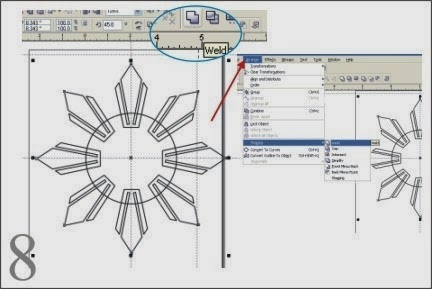 Go to ARRANGE > SHAPING > WELD or simply click on the weld icon on property bar. …. and this is it! There's more! 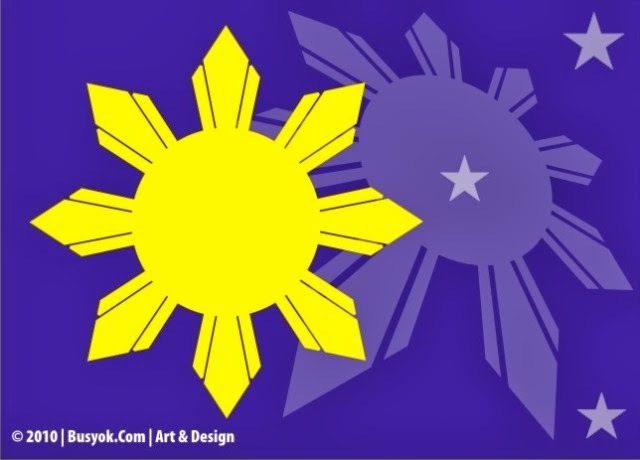 I have generated a downloadable PDF version of this How to draw the Sun in the Philippine Flag in 8 easy steps tutorial (Free coreldraw tutorial pdf) for you to download for free so that you may follow the easy steps even if you are offline. 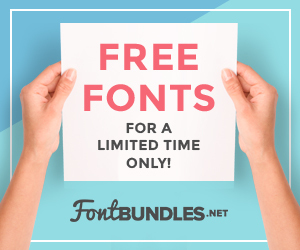 If you have any comments or suggestion regarding my tutorials, please use the comment box below. Thanks.